to what God has already given you in your life. You can also give in person at our Kiosk located inside our church lobby. It is safe and secure and easy to set up. The Bible says in Romans 13:8 "Let NO DEBT remain outstanding, except the continuing DEBT to LOVE one another." In other words, we believe that that owning our building would allow us to be DEBT FREE and to help us increase our DEBT to LOVE one another. That is why we are asking you to help us purchase our building and become DEBT FREE. 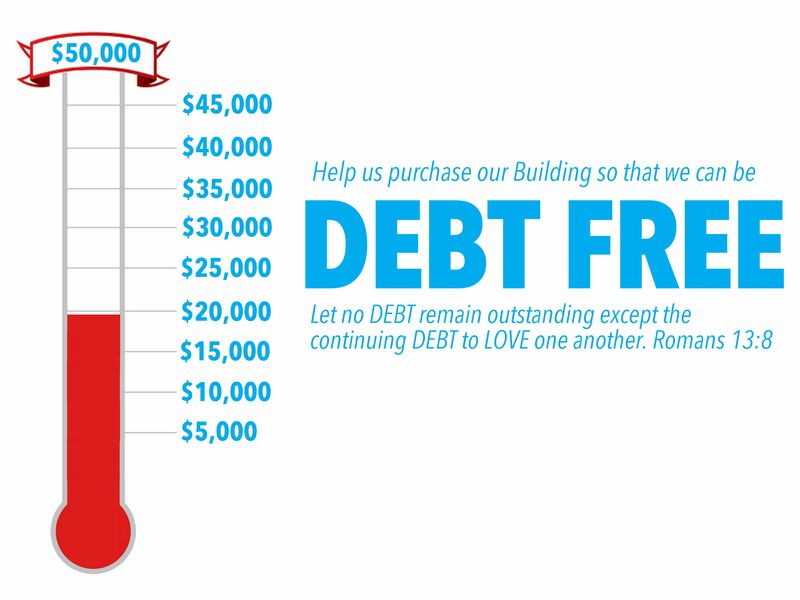 If you would like to Make a Donation to the DEBT FREE Campaign, please CLICK HERE. If you would like an Update on how much has been Donated, please CLICK HERE. If you would like to Watch a short video containing the Vision and Details of why we should purchase our building and be DEBT FREE, please CLICK HERE. If you would like to Listen to Pastor Paul presenting the VISION to the church, please CLICK HERE. If you would like to See the building and what the Upgrades may look like after the Purchase, please CLICK HERE. If you would like to See an Explainer Video that explains the details of Why we are purchasing our Building, please CLICK HERE.